One way to make a salt is to react a metal with an acid. However, not all metals react with acids and those that do often react at different rates. 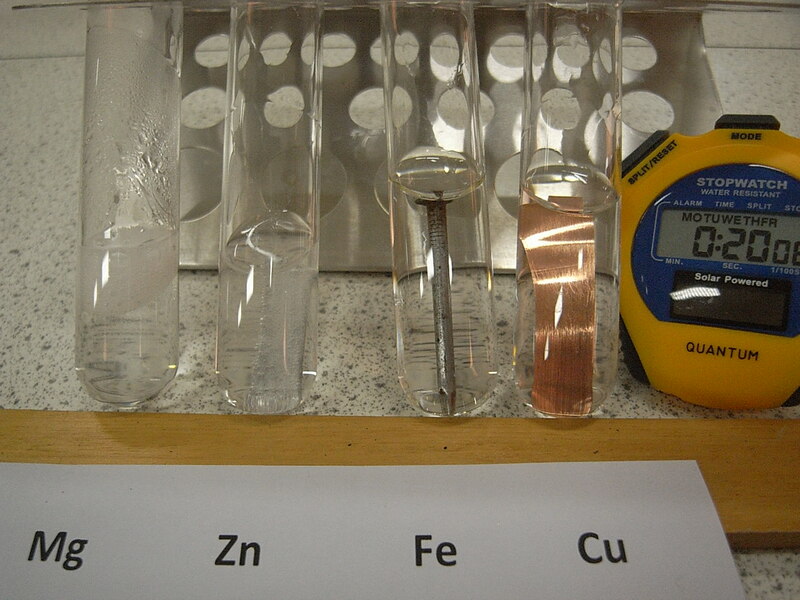 GCSE level students learn a reactivity series of metals. This lists a number of common metals in order of decreasing reactivity in chemical reactions. Potassium is the most reactive metal in this list and gold is the least reactive. 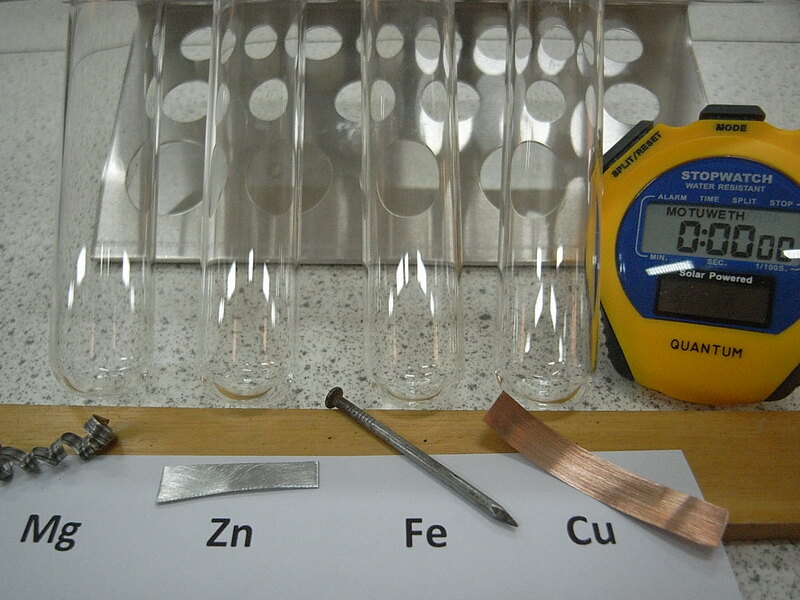 At school students frequently carry out reactions on a test-tube scale to illustrate the reactivity series of metals. One such reaction is the reaction of metals with hydrochloric acid. 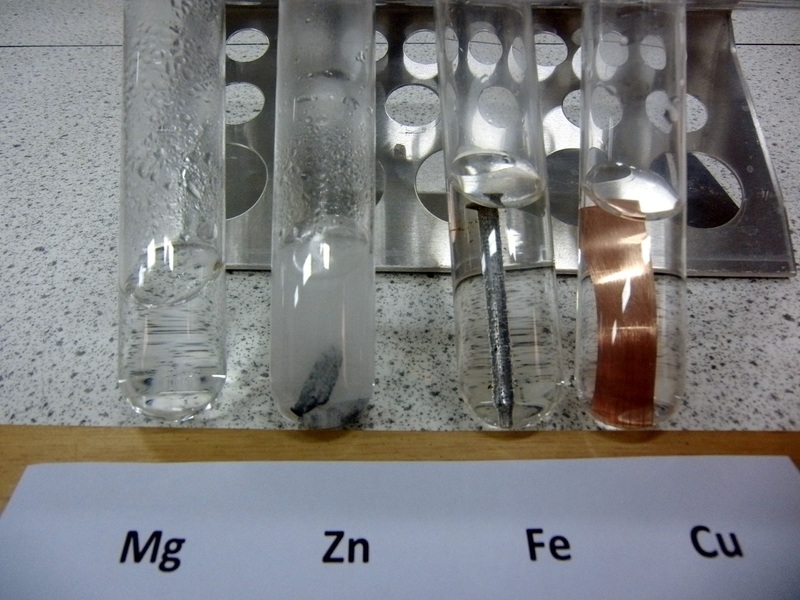 In the pictures below magnesium, zinc, iron* and copper are shown reacting with 2M hydrochloric acid. What is the order of reactivity of the four metals with 2M hydrochloric acid? After about a minute magnesium is seen reacting the most vigourously of the four, followed by zinc which is the second most reactive. *The ‘iron’ nail is almost certainly not pure iron, but probably a form of steel. Under these conditions the magnesium completely reacts in a couple of minutes. After about an hour the zinc is seen reacting steadily and bubbles of hydrogen gas can be seen on the surface of the nail. 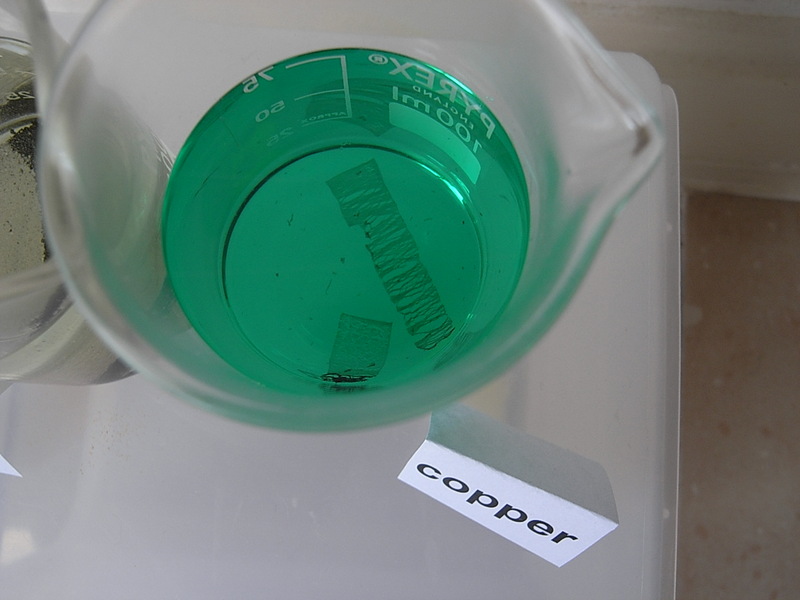 Copper is sometimes described as being unreactive in this experiment, but the word unreactive must not be taken to mean ‘does not react at all’. Copper metal does react with 2M hydrochloric acid, only it reacts rather slowly. This is illustrated by the animation below (apologies for the wobbly nature of the timelapse photography here). 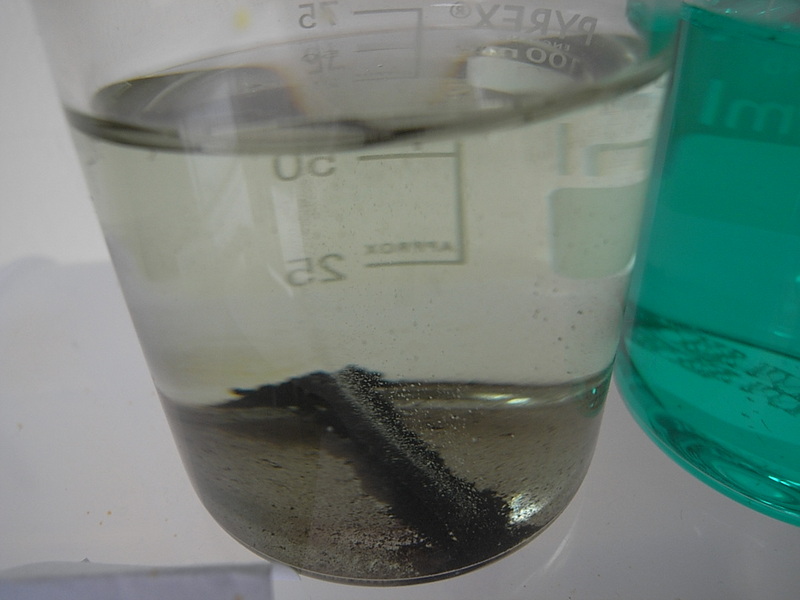 In this experiment, at the end of one week the rather thin piece of copper foil had virtually all gone, whilst the much bigger iron nail, or its remnants, were still seen bubbling away. Thus, copper can be described as being relatively unreactive in this reaction with 2M hydrochloric acid, but it does react slowly. Can you suggest any metals which would not react with 2M hydrochloric acid? Last time quiz crystal 1 was quartz and quiz crystal 2 was iron pyrite or Fool’s Gold. The answer to the third quiz question was neutralisation. ← What does the word ‘salt’ mean?